Key professional associations and building sta ndards organizations from around the world have formed the International Fire Safety Standards (IFSS) Coalition. There are more than 30 member organizations including, the International Code Council (ICC), the Society of Fire Protection Engineers (SFPE), and the Council on Tall Buildings and Urban Habitat(CTBUH). The coalition is committed to developing and supporting a shared set of standards for fire safety aimed at delivering greater consistency of minimum levels of fire safety and professionalism in buildings around the world. “The Grenfell Tower fire focused the world’s attention on how many buildings are threatened with the prospect of failing fire safety standards. All over the world we see the need for more high-rise structures which pose risks in the absence of a coherent and harmonized approach to setting global standards in fire safety. 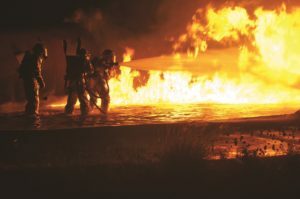 The effort by the IFSS Coalition aims to address this concern and bring together the design, construction and management aspects of ensuring fire safety of building assets,” says Gary Strong, Royal Institution of Chartered Surveyors(RICS), Global Building Standards Director and Chair of the IFSS Coalition. Once the group develops the new standards, it will assist with local implementation around the world.